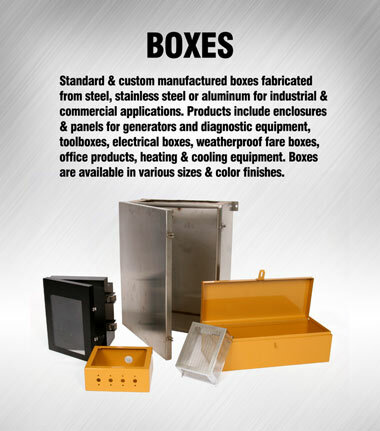 Standard and custom manufactured boxes for outdoor, marine and industrial applications. A key market area for Cannon is standard and custom manufactured enclosures that are fabricated from steel, stainless steel or aluminum for industrial and commercial uses. Manufacturing boxes and enclosures from stainless and carbon steel is a significant business unit for Cannon where we serve a wide variety of industries. Aluminum and stainless steel boxes are used for traffic signaling controls and ticket vending for municipalities across the nation. We have also designed and built a wide variety of toolboxes where we own the design rights, and guarantee the designs for manufacturability to keep costs low. Cannon builds enclosures for outdoor generators and marine applications. Engine manufacturers use these products to house electronic engine components inside a watertight box to protect them when used in watercraft. We specialize in weather-tight, air-tight parts and have produced components that go through a 40 MPH, four inch per minute, four hour rain storm during testing because there is no moisture allowed inside the enclosure. Boxes are available in various sizes and color finishes.